Track Certification: Restricted - valid until 30th Apr 2002 (survey required before records can be ratified, exclusions: DT/HT as netting had rotted and the gate opening was too wide, PV needs attention). The track was originally a 5 laps to the mile grass one. It was upgraded to redgra in winter of 1963/4 at a cost of £32,000 and to synthetic in Aug 1995 by Polysports at cost of about £250K. The old pavilion was demolished in Dec 1998 and a new one, called the Harrier Centre, was officially opened on 10th September 2000. Club competitions are not allowed because they are considered 'too noisy' but schools meetings are allowed!!! As a result the SC water jump was not put back in when the track was resurfaced. 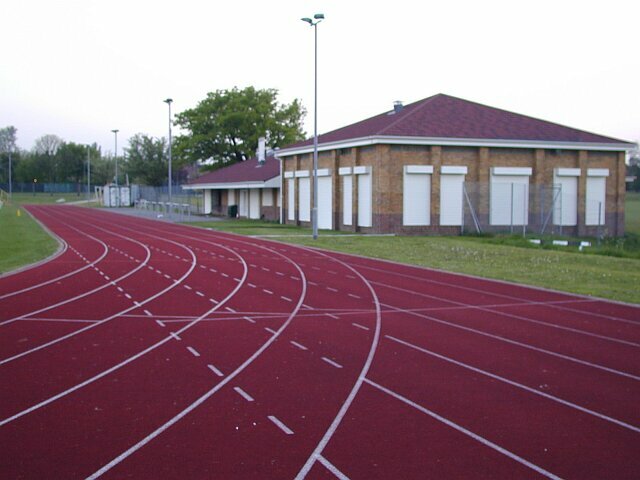 The track is managed by Epsom & Ewell Harriers but owned by the borough council.